It’s Valentine’s Day. I often wonder about traditions. Today I’m researching flowers and why we give them to our loved ones on this special day. I found the term “floriography” on Martha Stewart’s beautiful website. It’s a tradition started in Victorian England when flowers were delivered to express a love interest to a lady fair. I found the photo I’m featuring above on a site that talks about the flower artistry of Rebecca Louise Law. Ms. Law adorns the most unusual places with flowers! Can you imagine the glorious fragrance? I love this bouquet in a heart shape! Colorful and capable of being dried and preserved to be enjoyed for years to come. Somehow the flowers don’t seem to wasted in this form. I hate watching cut flowers wither and fade away. It’s always so sad when it is time to dispose of them. This bouquet can live on! I also love unusual containers! Isn’t this a lovely arrangement? The more unique the combination and presentation the better! I hope you’ll enjoy and celebrate love today and everyday! We don’t have to wait for February 14th to send a message with flowers! This is our new home! Over the next few weeks I’ll share projects we’re working on both inside and out. Curb appeal….enhancing that with new flower beds and planting a willow tree in the middle of the circle of grass. Thus we have named our home Willow Haven. I can’t wait to take you inside! I’m hosting a guest blog from Luxe Decor featuring the amazing style of New Orleans! I hope you’ll enjoy this post as much as I have! Classic New Orleans style is romantic and elegant while being infused witha gothic sensibility. For those seeking a Southern style refresh with a Big Easy twist, there are many elements to consider. Classic and refined decorative elements will work for any home seeking to capture New Orleans spirit. To amp up the Creole charm, here are a few design trends to explore. Revel in the spirit of the French Quarter with vintage furnishings in colorful prints. Add framed clown pictures for the jovial atmosphere of Mardi Gras all year round. Take a cue from the historic and gothic elements of New Orleans and design a living space dedicated to luxury. A plush velvet chaise takes center stage in a room with gray tile flooring as well as traditional parlor accents like chandeliers and a large fireplace. Create a cozy family room while adding timeless New Orleans style by incorporating old-world décor. A large candelabrum takes center stage while bookcases with attached sconces provide unexpected regal flair. For creating a real nod to bayou country, adding a large mural or intricate wallpaper will make a dining room feel like a mysterious museum. A classic dining table set makes for a trip back in time to the days when New Orleans was a cotton port and home to many French aristocrats. For truly reinventing the style of NOLA, there’s no better decorating strategy than to forget less is more. Filling a space with eccentric art, colorful vases and funky furnishings will truly replicate the wild and wacky world of this eclectic and unforgettable city. It’s Finally Friday and I’m back with a great recipe that is quick to make and oh so delicious! When a family is moving it is easy to grab something from a fast food establishment or food market than to cook. Add to that the fact that just after we moved here I underwent a full left knee replacement and that explains why I have not been posting about food very much. I was concerned about gaining weight while off my feet but the opposite has happened. I’m feeling better and more fit than I have in a very long time. So I’m back in the kitchen, getting creative and coming up with recipes I think you’ll love! Today’s recipe works as an easy weekend meal that even guests will love! Pair it with a cold Corona and you’ve got it going! Heat the enchilada sauce in a pot until just simmering. Heat the olive oil in a medium size skillet over medium heat and add the onion, cooking until it is just transparent. Add the chopped bell pepper, rinsed black beans and garlic and heat through. Grease an oblong pyrex or other pan and pour 1/2 cup of the enchilada sauce into the bottom and spread to cover. Take one tortilla and dip it into the remaining sauce to soften it. Place it in the baking dish and spoon the black bean mixture down the middle and sprinkle with a bit of cheese. Gently fold one side of the tortilla over the other and place seam side down in the baking dish. Repeat this method until you have made 10 enchiladas. Pour the remaining sauce over the enchiladas and sprinkle the rest of the shredded cheese over the top. Cover with foil and bake for 30 minutes. Uncover and back for ten more minutes, the cheese will be melted and the sauce should be bubbly around the sides. Place two enchiladas on each plate. Top with shredded lettuce then guacamole salsa and sour cream. Serve with tortilla chips if desired and don’t forget that icy cold beer! Enjoy! 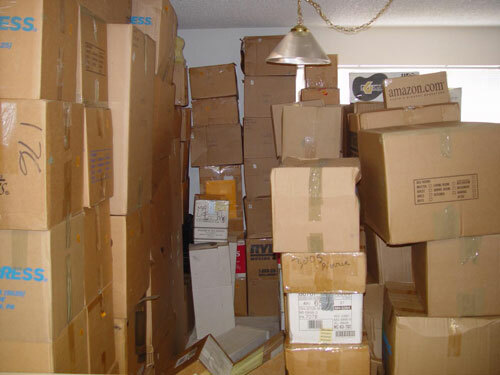 Not our boxes…but this does some justice to what we’re dealing with! I’m a bit late getting this post out to my readers. Apologies to all! If you saw what I am dealing with here in our new home you would completely understand! I’ve decided to approach it all with a sense of humor, leaving the overall feeling of “will this ever be finished” behind! I have no pictures to share that would do our situation justice. Sufficeth to say we are blending two complete households into one. Included in that are about six sets of fine china…..a huge art collection….and glasses. I have never seen so many glasses in my life. Looking on the bright side I have to say that when Skylar decides to spread her wings and find her own “first” apartment she is all set. I have now begun to make boxes for that event with label “Skylar’s First Home”. I have mixed feelings about that statement but know it is an inevitable event that will help her on her way as she begins working and enjoying life in the Big Easy. Skylar is loving it here as are we all. A couple of minor glitches that always seem to occur during a long distance move are being dealt with in a positive manor. We are a family, connected in every way and moving forward each day with baby steps. We love our new home and neighborhood. We miss so many things about the island, but being only forty minutes away from our family here is so wonderful! I’ll keep you posted as things progress! Soon, I’ll be back in the swing of cooking, creating and writing about it all. Life is a process and the attitude with which we approach it defines what we experience! Here’s to a fabulous Monday filled with happiness for all!